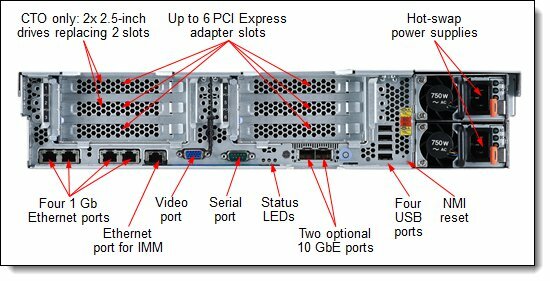 IBM System x3650 M4 HD - 2-процессорный 2U Rack сервер. Обновленная версия одной из лучших моделей. Сервер IBM System x3650 M4 HD - 2U двухсокетный сервер, предназначенный для критически важных бизнес задач. Улучшенная производительность и большое количество вариантов для последующего расширения, в совокупности с новыми возможностями управления превращают этот сервер в идеальное решение для первостепенных бизнес приложений, а так же для их развертывания в облаке. Отличный выбор для любого уровня: от малого и среднего бизнеса, до крупных предприятий. Processor Up to two Intel Xeon processor E5-2600 v2 product family CPUs. Two QPI links up to 8.0 GTps each. Up to 1866 MHz memory speed. Memory Up to 24 DIMM sockets (12 DIMMs per processor). RDIMMs, UDIMMs, and LRDIMMs (Load Reduced DIMMs) are supported, but memory types cannot be intermixed. Memory speed up to 1866 MHz. Memory maximums With RDIMMs: Up to 384 GB with 24x 16 GB RDIMMs and two processors. With UDIMMs: Up to 128 GB with 16x 8 GB UDIMMs and two processors. With LRDIMMs: Up to 768 GB with 24x 32 GB LRDIMMs and two processors. Disk drive bays Up to 26x 2.5-inch hot-swap bays supporting HDDs or SSDs (24 bays front accessible and 2 bays rear accessible); or 16x 2.5-inch HDDs/SSDs (front) plus 16x 1.8-inch SSDs (front accessible). Maximum internal storage Up to 41.6 TB with 26x 1.6TB 2.5" SSDs. Up to 31.2 TB with 26x 1.2TB SAS HDDs. An intermix of SAS/SATA is supported. RAID support RAID 0, 1, and 10 with integrated ServeRAID M5210e. Optional upgrades to RAID 5 and 50 are available with zero-cache, 1 GB cache without battery, or 1 GB or 2 GB flash-backed cache. Optional upgrade to RAID 6 or 60. Network interfaces Four integrated Gigabit Ethernet 1000BASE-T ports (RJ-45): Two embedded 10 Gb Ethernet ports (10GBASE-T RJ-45 or 10GBASE-SR SFP+ based) on an optional 10 Gb Ethernet mezzanine card (does not use a PCIe slot). Optional riser cards available through CTO with PCIe x8 or PCIe x16 or PCI-X slots. Slots 1 and 2 can be replaced with two 2.5-inch hot-swap drive bays through CTO. Ports Front: A breakout cable port offers two USB 2.0 ports and one DB-15 video. Four USB 2.0, one DB-15 video, one DB-9 serial, one RJ-45 systems management, four RJ-45 GbE network ports, two optional RJ-45 or SFP+ 10 GbE network ports on rear. One internal USB port for embedded hypervisor. Cooling IBM Calibrated Vectored Cooling with up to four redundant hot swap fans (all standard; two fan zones with N+1 fan design; each fan has two motors). Power supply Up to two redundant hot-swap 550 W AC, 750 W AC, or 900 W AC power supplies (all 80 PLUS Platinum certification), or -48V 750 W DC power supply options. Hot-swap parts Hard disk drives, power supplies, and fans. Systems management UEFI, IBM Integrated Management Module II (IMM2), Predictive Failure Analysis, Light Path Diagnostics, Automatic Server Restart, IBM Systems Director and Active Energy Manager, and IBM ServerGuide. Optional IMM Advanced Upgrade software feature for remote presence. Limited warranty Three-year customer-replaceable unit and onsite limited warranty with 9x5 next business day (NBD). Service and support Optional service upgrades are available through IBM ServicePac® offerings: Four-hour or two-hour response time, eight-hour fix time, one-year or two-year warranty extension, remote technical support for IBM hardware and some IBM and third-party applications.